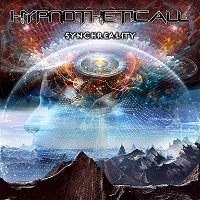 HYPNOTHETICALL are a progressive metal band, based out of Vicenza, Veneto, Italy, formed in 1999. This is their third full-length record entitled “Synchreality”, released through Revalve Records on March 16th 2018. It contains 10 tracks and a total of 46:51 minutes of music. Most of this album seems to revolve around the concept of reality in a different dimension, whether that is a dream state or virtual reality. This is the common thread, you will find here throughout the album. The intro “Synchronism to the Light” starts off nicely with some keyboard effects and transitions into much heavier guitars, it is a good precursor of what is to come in “Where All the Trees Bend” which has a cool throwback sound in the keyboards, bringing us back to the 1980s. The vocals from Davide Pellichero are usually very clean but he shows off his screaming abilities here and there at the end of the chorus. “Tribal Nebula” has a similar pattern in its synth introduction, and a repeated heavy rhythm section, which is borderline Djent music and supported by rougher vocals this time around, that could compare to modern IN FLAMES or THE QUIET ROOM. “The Spell” is much more melodic in its tones, and has that catchy side to it, akin to a band like PAGAN’S MIND and it is followed perfectly by “Industrial Memories” that contains more technical parts, and even radio-style effects in the guitars. It flirts again with the Progressive/Djent style, making it the heaviest piece of music you will hear on the album. The best way to describe it is a mix of ELDRITCH and ANIMALS AS LEADERS. “Dreaming in Digital” slows down the pace a bit, a calm intro and the atmosphere orchestrated here is very much like TOOL, it is a well-executed mid-tempo song, with some down-tuned guitars, that “Solstice of Emotions” borrows from as well, and contains some of the clearer bass lines of Luca Capalbo. It has a bit of spoken-word vocals, and a very good mix of melodies and hooks. It is definitely the darkest track of the album and one of the stronger ones. “In Hatred” is a very introspective piece with its piano track and pretty keeps that very serene feel throughout. Whereas “Rumors” picks up where most of the album left off and uses the modern metal approach, almost cyber-punk/thrash at times, this is as close to ELDRITCH of 2010 and beyond, you will hear on this effort. Lastly, we have “Analog Dream Experience”, a very strong closer, rich with dual acoustic guitars; everything about this outro is pristine and clear. Overall, this is a strong 46 minutes of progressive metal, revolving around this dream/reality theme and I am certain there are good things ahead for this band in the future.